Go Figure!, Just for fun, Life, WTF! …And I’ll Show It To You. Get your mind out of the gutter. That’s not what I mean. Tomorrow is a public holiday in Thailand. It’s a very religious holiday, which, like all religious holidays, means no alcohol sales. And, my supply of essential blonde liquid was running low. I know, I could have shopped today, but what if they’d sold out? Did you think of that? No you didn’t. But I did. So I shopped yesterday afternoon. I arrived home early evening and thought “I’ll have a quick shower, a quick rest, a quick beer, and then I’ll make a quick supper. Well, it was probably my fourth shower of the day, but hey, it’s hot here. And as it turned out, it was probably my quickest shower ever. After about three seconds the water stopped. “WTF” and other obscenities. Don’t tell me the pump’s broken again. Strange though. Usually when the pump dies at least some water can pass through. But yesterday there was nary a dribble. So I hastily dressed, turned on the outside light, stuck my nose out the front door, to discover that while I was out, someone had taken away my water meter, and sealed the pipe, as you can see above. Oaths were uttered to cause unspeakable diseases to descend on meter stealers and their first born sons. 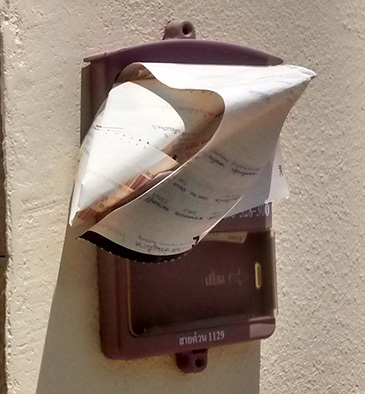 Strangely no one rushed round to return my meter. Not only was I waterless, my oaths were defective. But at least I had beer. Lots of it. You see, the thing is, I hadn’t paid any water bill in at least, oh I dunno, six weeks. Imagine that. Quelle horreur. Six weeks. I should be deported, or worse. But in my defense Your Honor, I’d like you to take into consideration the mitigating circumstance that I hadn’t actually received a bill. And not for the first time. In the past, I’d dutifully visited the PWA office, only to be told, after much chitting, chatting plus giggling, that I didn’t owe anything. I can recognize that – stupid old fart’s forgotten he’s already paid – look. But I hadn’t. It seems that if the bill doesn’t come to me it goes to the company that owns the whole development and they pay. Eventually someone knocks on my door and demands money. So, I figured – that’s cool. One day I’ll pay. But nooooo. I owed money. And if you owe money you can’t have water. So early this morning, even before the PWA office was open, I donned my annoyed-but-not-enough-to-scare-nice-friendly-Thai-people look and rushed out to complain. Job #1 was to pay money. How much? 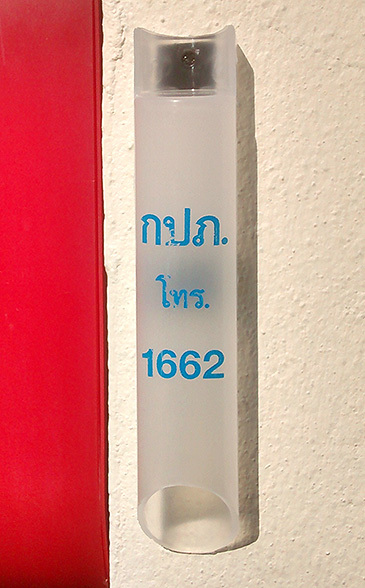 Baht184. Sounds like a lot, right? But it isn’t. It’s a little less than US$6. Imagine someone wasting time and money to remove a meter and denying you any further water when you owe six bucks. Mind boggling. Having settled that, the nice lady – who was rather busy feeding breakfast to her young daughter – figured she’d finished with the annoyed-but-not-too-angry-looking farang. Ha! Wrong. “But I don’t have water” I said politely, pointing at what I figured was my meter sitting next to her desk. I wasn’t sure what was going to happen next, but it involved six people and someone on the phone. The upshot of which was that I was assured my meter would be returned faster than I could say “Krung Thep Mahanakhon Amon Rattanakosin Mahinthara Ayuthaya Mahadilok Phop Noppharat Ratchathani Burirom Udomratchaniwet Mahasathan Amon Piman Awatan Sathit Sakkathattiya Witsanukam Prasit” ten times quickly. Which, by the way, is the correct name for Bangkok. Maybe I’ll settle for saying Bangkok ten times quickly and my meter will magically return. I didn’t have a magic tube. And without a magic tube they had nowhere to put the bill. And if I didn’t have a bill I couldn’t pay for the water. And if I wasn’t going to pay for the water – well, they weren’t going to allow me to have any. These things make perfect sense in Thailand. Now, I also don’t have a magic box. And the magic box is where the electricity meter reader is supposed to put his bill. You can see one on the right. The bills don’t actually fit in the magic box. But no matter, you’re supposed to have one. But the electricity man must eat Wheaties for breakfast because he’s figured out he can put the bill in my mail box instead. He could probably be fired for doing this. Not so the water man. I think he must skip breakfast as I’ve no idea what he does with my bills. Maybe those are his breakfast. That would explain a lot. So I now have a magic tube, and I said you could look at it. Nice eh. I feel I should put a rose in there, but that wouldn’t work because the water would run out the bottom. On the days when I have water of course. Anyhoo, before I left the PWA office, it was explained to me in great detail how I should stick it, which way I should stick it, and where I should stick it. Which is just as well because at that very moment I was thinking of somewhere else I could stick it. Toilets have been flushed. Teeth have been brushed. Dishes have been washed. And a stinking body has been cleansed. Not necessarily in that order. Today is a good day. Twitterings is back to normal, whatever that is.